We reached our trip’s destination today! 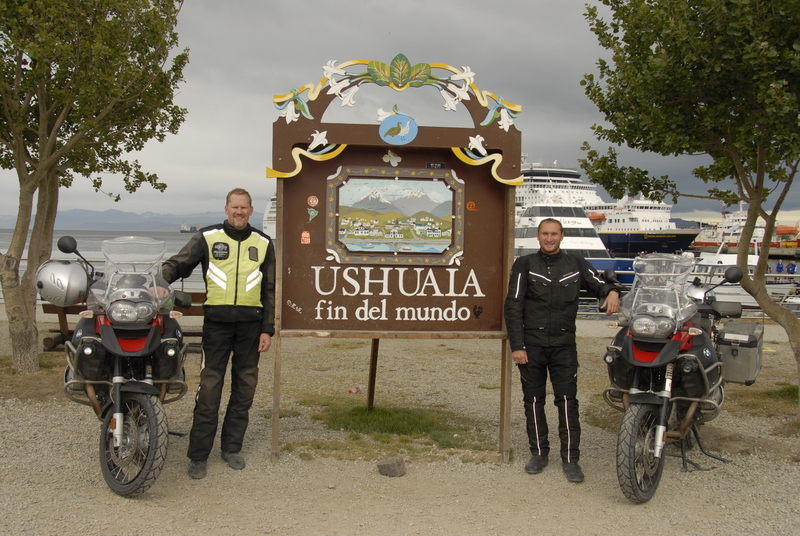 At 18:45 local time, Vadim arrived to Ushuaia in Tierra Del Fuego (Land of Fire) – the most southern part of Argentina that is considered “The End of the World”. Gintaras came in an hour later due to rain that started during the last hour of our trip. This is a significant day for both of us. We started our adventure on October 4, 2010 and rode our motorcycles from Washington DC for 4 months and 2 days. We crossed 13 countries on two continents covering 25,328 km (15,830 miles). Our trip covered United States, Mexico, Guatemala, El Salvador, Honduras, Nicaragua, Costa Rica, Panama, Columbia, Ecuador (including Galapogos Islands), Peru, Chile (5 times), Argentina (5 times) and Antarctica. Many thoughts go through our minds and it is nearly impossible to put it all in one day’s blog. We are happy and sad at the same time as our adventure ends today (we still have about 4-5 days of riding to Buenos Aires in order to ship our bikes back home). There is an overwhelming feeling of disbelief of how many places we were able to visit during the 4-month period and all the friendships we acquired. This was an adventure of a life-time as we were emerged in many different cultures, met many amazing people, and dealt with many life situations while constantly being on the road in foreign environments. This trip toughened us as we rode in extreme heat and cold conditions, fog, heavy rains, flood zones, on gravel roads, on muddy roads, in sand, high in the mountains, deep in the canyons, in deserts, in large cities, small villages, and unpopulated areas. This trip was one of the best things I have done in my life. I am very happy I did it! Being on the road, in an open environment via traveling on motorcycle, for 4 months was a true physical and emotional test. Gintaras and I had to endure many things and rely on each other. I met many interesting travelers from different parts of the world and have become friends with them. I learned many things from them and my life have become more interesting and richer as a result of all these experiences. I advise everyone to try something like this in your life as you will discover new things for yourself that cannot be found via conventional travel to known destinations. Before I went on this trip, one world traveler told me that this trip will change my life. It certainly changed my life in a better direction!! !